This year I had the honour of capturing the wedding of my friends Olenka and Josh. Their day was filled with great candid moments amongst family and friends - it made my job of documenting the occasion feel easy! Most of the day's events took place on the outskirts of Ottawa, in the township of Russell. Both the ceremony and reception were held at Olenka and Josh's beautiful farm house - an intimate setting for such a special celebration. While guests trickled in for the ceremony, Olenka, Josh and I escaped to a nearby forest to capture their first look. We made some time for a few portraits of the two of them before heading back to the ceremony site. Everyone was patiently waiting, including Josh's family dog who got to walk him down the aisle... how's that for the tables being turned!? Later on, Olenka's band, Amos the Transparent, had the special task of serenading guests during cocktail hour. They were excellent! This was definitely one of my favourite weddings to photograph; I hope my friends will enjoy the images for years to come. 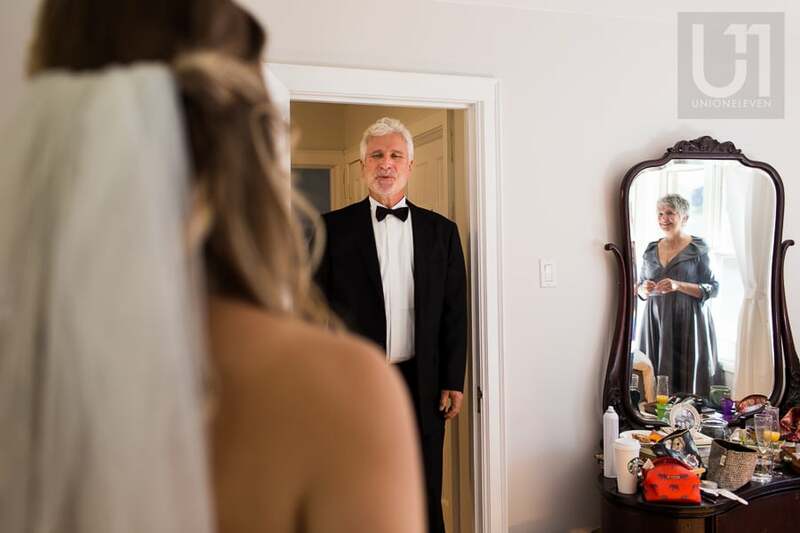 bride standing in room while her father stands in the doorway, seeing her for the first time; reflection of the bride's mother in mirror on the right side of the room. Bride and groom standing in an embrace, facing each other and touching noses in a corn field in Russell. 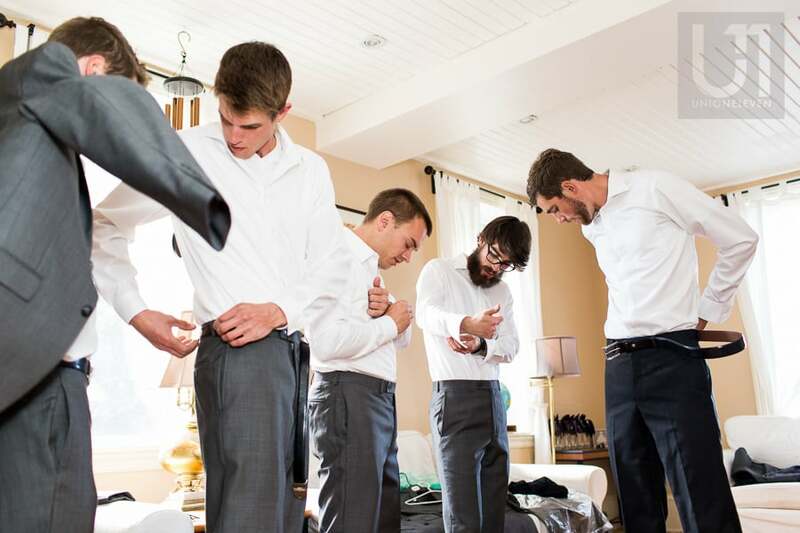 Groom standing at alter at outdoor wedding ceremony, petting his black and white dog while minister watches them both. Wide angle shot of outdoor wedding ceremony in Russell, Ontario; set between two large trees. Bride and groom sharing first kiss while wedding party looks on at outdoor wedding ceremony in Russell, Ontario. Bride and groom happily walking down the aisle, laughing after being announced husband and wife at wedding ceremony in Russell, Ontario. Bride and groom toasting with a shot amongst friends and family at a wedding reception in Russell, Ontario. 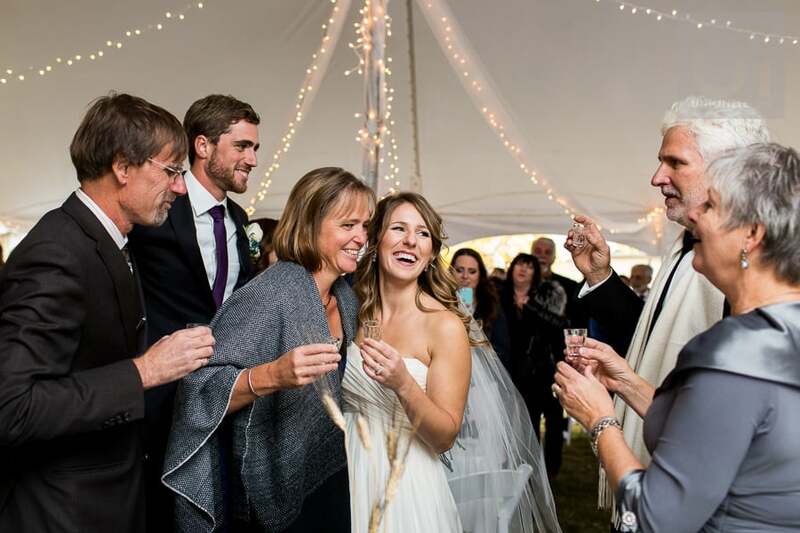 Young man holding up a wine glass as a toast during wedding reception in Russell, Ontario. Older man and woman giving a speech during wedding reception, with draped fabric and twinkle lights hanging in the background,. Bride and groom sharing first dance and laughing while their wedding guests watch under a tent lit by beautiful twinkle lights. Close up of woman dancing with man under a lit up tent at wedding reception in Russell, Ontario. Young man carrying another man while laughing on the dance floor at wedding reception. Three men dancing and cheering on dance floor at wedding reception, the man in the middle holding his fist up in the air while he appears to be singing to the music. 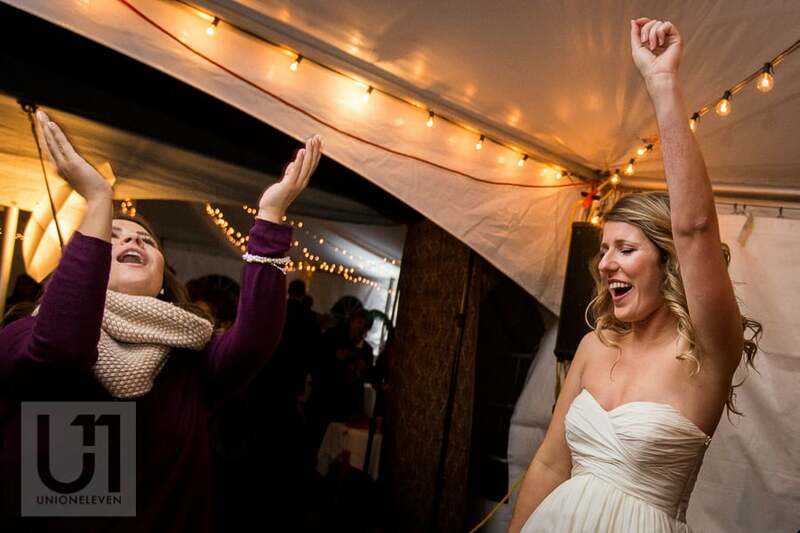 Bride dancing on dance floor at wedding reception with female guest, while holding up her fist in the air and singing to the music.